Please note: Music University will be held prior to the concert on March 14 at 7:45 (following minyan) in the Chapel. The subject is the music from the March 18 concert. Join Cantor Joseph Ness for an A/V presentation about Baroque and Classical music. FREE admission. Open to the public. 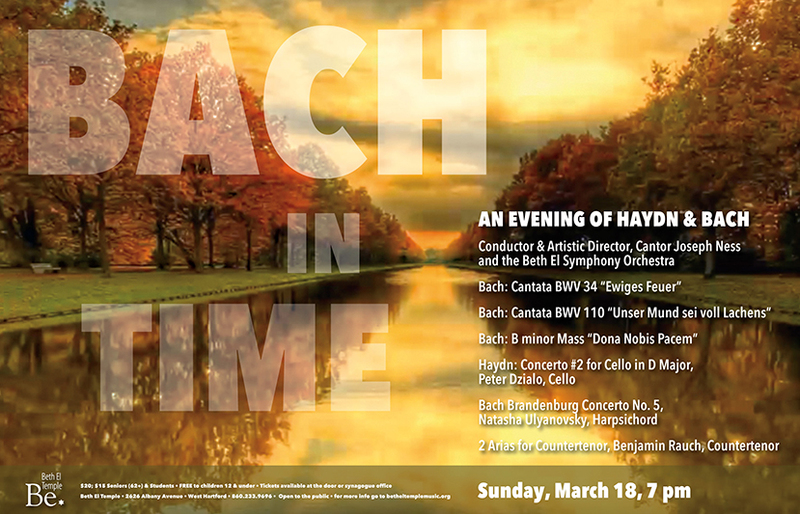 Tickets for Sunday, March 18, Haydn & Bach are $20/person; $15/seniors (62+) and students. Children 12 and under are admitted free of charge. Tickets are available in advance in the Temple office or at the door. Open seating. Plenty of free parking. Handicapped accessible. Open to the public. WHERE ELSE COULD MUSIC BE THIS HEAVENLY?